"Mosaics made easy with concrete"
A process called LithoMosaic allows contractors to install large public artworks in the time it takes to pour a sidewalk. "Concrete cuts costs for UC-San Diego building"
Specially designed concrete columns reduce floor-to-floor heights, shaving $750,000 from the budget. 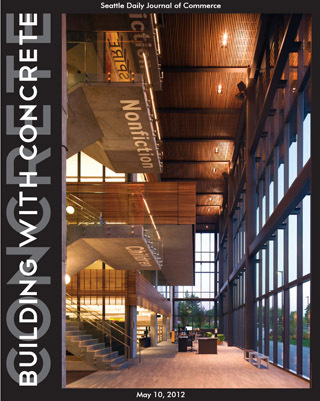 The Vancouver Community Library was the grand winner at the Washington Aggregates and Concrete Association's 44th Annual Excellence in Concrete awards.